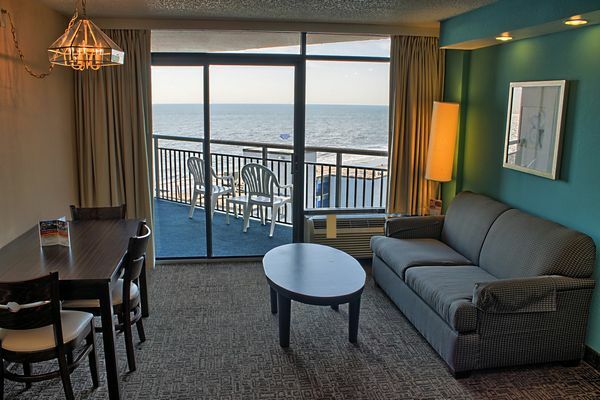 Here at Captain’s Quarters Resort in Myrtle Beach we have an array of accommodation types including suites. If you are looking for a suite with the main feature being a king bed, then the Oceanfront or Ocean View King Suite may be perfect for your family. The Ocean View King Suite features one king bed in the bedroom as well as a living room with a double murphy bed as well as a double sleeper sofa. This suite is located on floors 4 through 15, with one being located on each floor. Featuring a private balcony, this suite has a side view of the ocean. The Oceanfront King Suite, on the other hand, has an oceanfront balcony with a direct view of the ocean and is a great choice if you are looking for fantastic oceanfront views on your family vacation. This suite also has a king bed in the bedroom and a living room with a murphy bed and sleeper sofa. Located on floors 2 through 15, this suite is a popular choice. Both of the King Suites can sleep up to six people (no more than four adults) and come complete with a full kitchen so you and your family can cook during your Myrtle Beach vacation (only if you want to!) as well as one bathroom. All suites at Captain’s Quarters hotel come with free Wi-Fi, in-room safe, iron and ironing board. Want to learn more about other accommodations available at this resort? Check out our accommodations page to view suites, efficiencies, rooms and more!